Lift the furniture instead of dragging when you move the furniture from one place to another. Often while dragging the furniture you may some scratches being made or in the worst case scenario; you may see some of the finishing of the wood floors coming off. 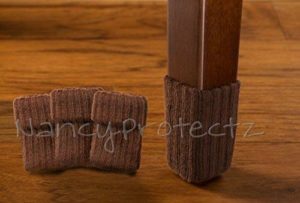 Repair the uneven spots on the furniture leg. Uneven legs can put pressure on a particular point and cause damage to that area. Avoid animal interaction. This might seem offensive but let me assure you first that I also am an animal lover. Our furry friends may confuse the wood with scratch toy and do their artwork on them. So it’s safe to keep them away from such floors. Do not use cleaners that contain ammonia, vinegar, wax or waxy substances, polishes, Oily soap. These materials can react with the wood and even make the wood rot. Tap-on pads: These are also called nail-on pads. You can fix them to the furniture feet by screws and don’t worry about the misplacement of pads. They are fixed permanently. So, a thing that can be done is to fix them in a proper manner and in accurate place. Adhesive pads: These peeling pads are very sticky, so make sure to put them in place. The rubber area should be facing the floor. Since glue doesn’t last forever the pads will also lose its stickiness. Slip-on pads: These soft plastic pads won’t cheat you by falling off like adhesive pads or wearing off like nail-on pads. They fit perfect with furniture feet. They are like the socks of furniture feet. Carpet: Just cut a piece of an old or new carpet according to your desired shape and then tailor it the way you want. You can use different colored carpets at the same time to create diversity. Felt: Cutting and gluing of pieces of felt can also be helpful. But if you are using a glue gun then be safe with the hot glue and always try to level things up. Because hot glue dries easily and may cause unevenness. Velcro: Use the soft side of Velcro facing the floor. You can also color and make knots to have an expensive look. Towels: Again cutting old pieces of the towel is a good plan instead of throwing them out. Many puffy threads towels can be uneven. This will interfere with the level and cause damage to both the furniture and wooden floor. So, make sure to use plain towels. You can sew the pieces or glue them or knot them with thin threads. But if you are threading them then make sure to use the same colored threads to make things less awkward. Lastly, keep in mind that these pads may slip from place to place. So keep checking up on them from time to time. If they move away from the underneath of your furniture then there is no use of the hard work. Another important thing is leveling. Keep all the pads as level as possible in all sides so it doesn’t put pressure on a particular spot. Another thing is dirt. A dirt free floor does almost 45% of the entire job.